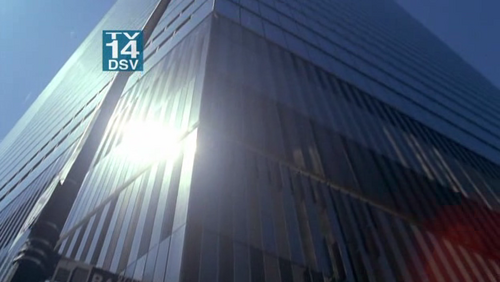 Shown from the outside, Massive Dynamic’s HQ reverts to something much more banal but turns out in the third episode to be Seven World Trade. Jimmy makes a good point that this approach belies a general laziness on the behalf of the production designers who use collage instead of actually designing something. 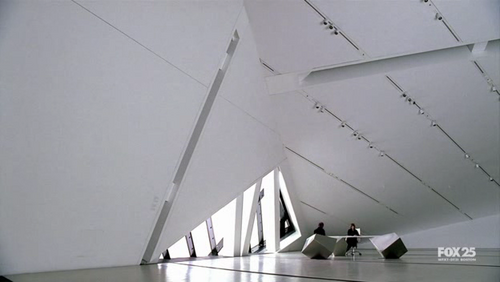 Without the bigger budget of a feature film we can perhaps excuse the show for not designing their own buildings, but did they really expect a show designed for detail obsessed nerds to accept a building that is clearly orthogonal from the exterior and billowing when seen on the interior? 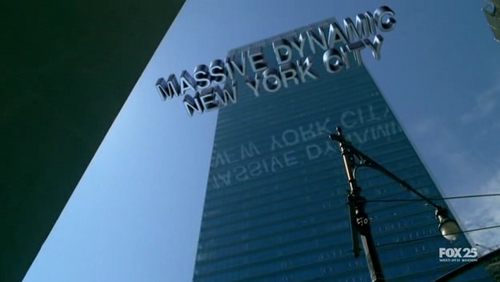 Not even Massive Dynamic can pull of that sort of trick. 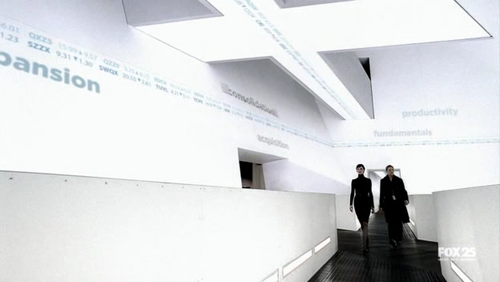 What I’ve been enjoying most about Fringe is another bit of trickery: the way that the location titles are integrated into the space of the scenes using camera tracking and environment mapping. By adding motion to an old technique these titles gain a new sort of augmented-reality authority. They’re not real… right? This, too, is part of our new way of seeing the world. There was a moment in the first episode, where we saw the title “Baghdad, Iraq” from the air — and then suddenly, the view switches to a street view, looking up at a helicopter, and you realize you’re looking through the hole in the giant ‘D’. It was totally unexpected — it blew my mind.